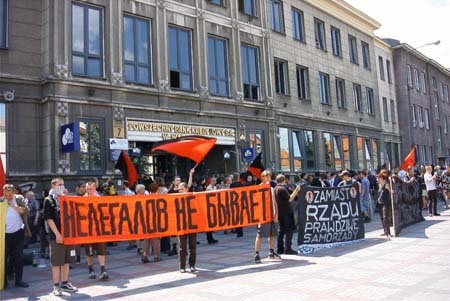 Polish camp starts with a first demonstration in Bialystok. 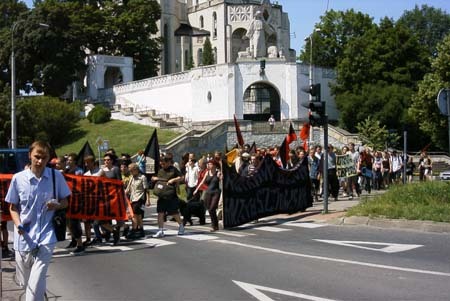 05.Jul.01 - About 250 activists from Poland, Ukrainia, Belarus, Russia, Finland and Germany opened the noborder-camp with a demonstration in Bialystok in spite of the ban of the demo by the major. Freedom of movement and against the fortress Europe were the main slogans. On the morning a press conference took place, where activists from eastern european countries analyzed the meaning of the new border policy for the relations in eastern europe, especially between Poland, Belarus ad Ukrainia. Also the noborder network was presented and the interconnection between the camps which take place in Europe and Mexico. In this moment the participants are moving to Krynki with coaches and will start constructing the camp.